Fourth Row Center: Film Writings by Jason Bailey: On DVD: "Deflating the Elephant: Framed Messages Behind Conservative Dialogue"
On DVD: "Deflating the Elephant: Framed Messages Behind Conservative Dialogue"
Honestly reviewing political films can be a tricky business, because it can be difficult to separate one’s ideology from what is on the screen; often, we respond to the message and not the messenger. So let me get this out of the way before plunging into Deflating the Elephant: Framed Messages Behind Conservative Dialogue, because if I don’t, it will be the elephant in the room (har har): I’m a proud progressive who would be hard-pressed to find one word in Deflating the Elephant that I disagree with. And by the fifteen-minute mark, even I was ready to switch it off. The central conceit—that over the last thirty-some years, conservatives have managed to reframe the issues, change meanings, and push ideas and agendas primarily through their use of language—is an intriguing one, and many of the topics covered (economic trends, foreign policy, values voting, the comingling of the conservative movement and strict Christianity) are worth examination. The trouble is, “director” Aldo Vidali hasn’t bothered to find a way to discuss them in a documentary or filmed essay form. His film is, and I’m not exaggerating, two hours and four minutes of people (mostly one person) talking directly into the camera. No cutaways, no clips, no examples, no nothing. Point and shoot. You might think that nothing would be duller than a static camera shooting one man talking for twenty or so minutes at a stretch, and you know what? You would be right. We begin with on-screen text laying out the thesis of the film, followed by a brief introduction by Sean Penn, followed by a brief outdoor section, in which Vidali interviews George Lakoff, an author and professor of cognitive linguistics at UC-Berkely (hold on, Sean Penn and a Berkely professor? Bill O’Reilly would have a hemorrhage watching this thing). The interview is scored with odd music and interrupted by amateurishly choppy scrolling graphics (they look like Final Cut templates that were never properly rendered). Once they get that “flashy” opening out of the way, it’s on to the film, which is structured thusly: Penn rages about Bush for a couple of minutes, and then Lakoff (seated at a desk in front of a map) talks and reads for ten or twenty minutes. Then back to Penn, then back to Lakoff, over and over, and then it’s done (following an end credit sequence that is simply a list of names, with no explanations of who did what). There’s no flow or continuity between the sections, which often end with an abrupt fade-out; Penn’s rants are frequently unrelated to what Lakoff says before or after him. They’re also less than timely; he was clearly shot while Bush was still in office, and his calls for a change in government and a revolution are a few months late and haven’t aged well (I’m a fan of his acting and agree with much of his politics, but he frankly sounds a little unhinged here). But what’s more distressing is the utter lack of visual stimuli. 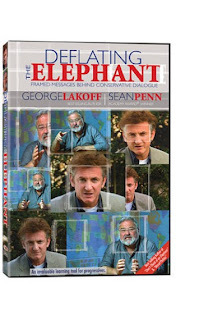 If all you want is information, read a book—Lakoff has written a couple, in fact, which Deflating the Elephant would serve as an infomercial for, except informercials give you something to look at. But this is not a book, it’s (purportedly) a documentary film. However, 124 minutes of people talking at you does not a documentary make. A doc might include multiple interviews (maybe even from people on the other side), or (for illustrative purposes) clips and examples of the infractions mentioned (as in Robert Greenwald’s films). And at the very least, it would shoot its interviews with more than one camera, so we can cut away to something else every few minutes or so. So it’s not a documentary; it’s a videobook, a filmed lecture, like one of those telecourses you take in college for an easy grade. But whatever it is, it’s not compelling, it’s not stimulating, and it’s not cinema. Deflating the Elephant: Framed Messages Behind Conservative Dialogue is a disc without much of a discernible audience; the conservatives it targets will certainly stay away in droves, while liberals like myself, while intrigued by the message, will likely be bored to tears. Perhaps it will be helpful to those who would like to audit Lakoff’s courses or have been assigned to read his books, but you must admit, that’s an awfully narrow demographic.